Closeout deal! 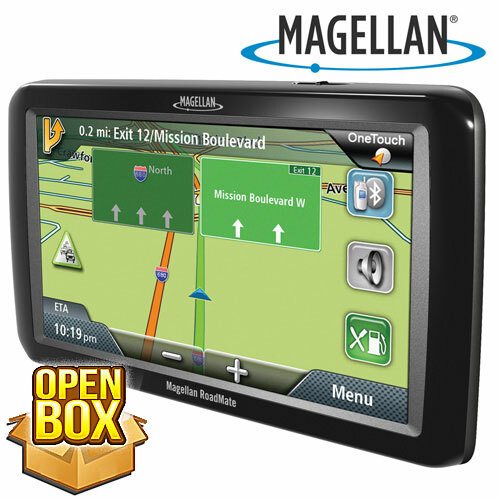 Lowest price we've seen on a high-end Magellan RoadMate GPS! Here's a great closeout buy just in time for summer road trips. One of the most feature- packed GPS systems we've ever offered, it has all the latest advancements that make traveling safer and easier than ever. It guides you to any address in the United States, Canada and Puerto Rico by voice so you'll never get lost again. Plus, it displays vital road information on the extra-large 7" hi-res color screen. Also features traffic alerts to save you time, Landmark Guidance that lets you receive directions using landmarks, PhantomAlert that warns you of fixed red light and speed cameras, Best Parking mode that provides parking garage locations, AAA Tourbook with information on hotels, restaurants and more, Bluetooth technology and built-in mic for pairing with your cell phone for hands-free speakerphone use and much, much more. Measures 7.63" x 4.53" x 0.75". Not available in AK, HI or P.R. Factory serviced to meet original quality standards. May have slight cosmetic blemishes. This is a customer return. Customer returned items have a 7 day return policy.